In economics, competition is a condition where different economic firms[Note 1] seek to obtain a share of a limited good by varying the elements of the marketing mix: price, product, promotion and place. In classical economic thought, competition causes commercial firms to develop new products, services and technologies, which would give consumers greater selection and better products. The greater selection typically causes lower prices for the products, compared to what the price would be if there was no competition (monopoly) or little competition (oligopoly). Early economic research focused on the difference between price- and non-price-based competition, while later economic theory has focused on the many-seller limit of general equilibrium. The competitive process in a market economy exerts a sort of pressure that tends to move resources to where they are most needed, and to where they can be used most efficiently for the economy as a whole. For the competitive process to work however, it is "important that prices accurately signal costs and benefits." Where externalities occur, or monopolistic or oligopolistic conditions persist, or for the provision of certain goods such as public goods, the pressure of the competitive process is reduced. In any given market, the power structure will either be in favor of sellers or in favor of buyers. The former case is known as a seller's market; the latter is known as a buyer's market or consumer sovereignty. In either case, the disadvantaged group is known as price-takers and the advantaged group known as price-setters. Competition bolsters product differentiation as businesses try to innovate and entice consumers to gain a higher market share. It helps in improving the processes and productivity as businesses strive to perform better than competitors with limited resources. The Australian economy thrives on competition as it keeps the prices in check . In his 1776 The Wealth of Nations, Adam Smith described it as the exercise of allocating productive resources to their most highly valued uses and encouraging efficiency, an explanation that quickly found support among liberal economists opposing the monopolistic practices of mercantilism, the dominant economic philosophy of the time. Smith and other classical economists before Cournot were referring to price and non-price rivalry among producers to sell their goods on best terms by bidding of buyers, not necessarily to a large number of sellers nor to a market in final equilibrium. Later microeconomic theory distinguished between perfect competition and imperfect competition, concluding that perfect competition is Pareto efficient while imperfect competition is not. Conversely, by Edgeworth's limit theorem, the addition of more firms to an imperfect market will cause the market to tend towards Pareto efficiency. Within competitive markets, markets are often defined by their sub-sectors, such as the "short term" / "long term", "seasonal" / "summer", or "broad" / "remainder" market. For example, in otherwise competitive market economies, a large majority of the commercial exchanges may be competitively determined by long-term contracts and therefore long-term clearing prices. In such a scenario, a “remainder market” is one where prices are determined by the small part of the market that deals with the availability of goods not cleared via long term transactions. For example, in the sugar industry, about 94-95% of the market clearing price is determined by long-term supply and purchase contracts. The balance of the market (and world sugar prices) are determined by the ad hoc demand for the remainder; quoted prices in the "remainder market" can be significantly higher or lower than the long-term market clearing price. Similarly, in the US real estate housing market, appraisal prices can be determined by both short-term or long-term characteristics, depending on short-term supply and demand factors. This can result in large price variations for a property at one location. Competition requires the existing of multiple firms, so it duplicates fixed costs. In a small number of goods and services, the resulting cost structure means that producing enough firms to effect competition may itself be inefficient. These situations are known as natural monopolies and are usually publicly provided or tightly regulated. 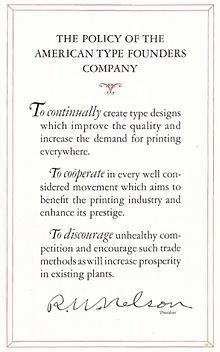 The printing equipment company American Type Founders explicitly states in its 1923 manual that its goal is to 'discourage unhealthy competition' in the printing industry. International competition also differentially affects sectors of national economies. In order to protect political supporters, governments may introduce protectionist measures such as tariffs to reduce competition. A practice is anti-competitive if it unfairly distorts free and effective competition in the marketplace. Examples include cartelization and evergreening. ^ This article follows the general economic convention of referring to all actors as firms; examples in include individuals and brands or divisions within the same (legal) firm. ^ Heyne, Paul; Boettke, Peter J.; Prychitko, David L. (2014). The Economic Way of Thinking (13th ed.). Pearson. pp. 102–06. ISBN 978-0-13-299129-2. ^ Cowen, Tyler; Tabarrok, Alex (2013). Modern Principles: Microeconomics (2nd ed.). New York: Worth Publishers. pp. 228–29. ISBN 978-1-4292-3999-8. ^ Hutt, William H. (March 1940). "The Concept of Consumers' Sovereignty". The Economic Journal. 50: 66–77. JSTOR 2225739. ^ "Competition is the key to a brave new Australia". ^ Lanny Ebenstein, 2015. Chicagonomics: The Evolution of Chicago Free Market Economics Macmillan, pp. 13–17, 107. ^ Poole, William. "Free Trade: Why Are Economists and Noneconomists So Far Apart?". Retrieved 2018-02-27. One set of reservations concerns distributional effects of trade. Workers are not seen as benefiting from trade. Strong evidence exists indicating a perception that the benefits of trade flow to businesses and the wealthy, rather than to workers, and to those abroad rather than to those in the United States. ^ J. Gregory Sidak, The Deterrent Effect of Antitrust Enforcement, 89 J. POL. ECON. 429, 429 (1981).